The Bible can seem pretty intimidating if you’ve never read it—lots of “thee’s” and “thou’s.” We want to make it easy for you to get started and build a habit of spending time with God by reading His word every day with these online Studies. 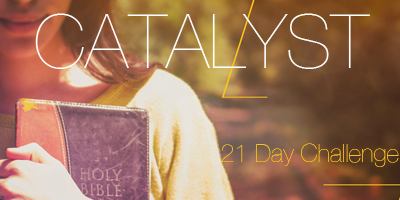 As a team, it is our prayer that Catalyst would spark a life-changing encounter with Jesus that would continue well after the event. Let’s dive deeper into the Holy Scriptures with this reading plan developed with American Bible Society. You’re the fulfillment of answered prayers; a generation desiring to know God and to be known by him. It’s on that foundation alone that we believe we will change the world.